By now, everyone has a particular website host that they are comfortable with. Whether you’re used to hosting static sites or complex proprietary web apps, you probably have a few go-to options. So you may think that it makes sense to do the same with your WordPress blog. But WordPress is a special animal, with many complexities…and who you choose as a host makes all the difference. In this article we look at three of the most well-known managed WordPress hosts: Bluehost, SiteGround, and HostGator. We will go deep into the four areas of most importance to people who depend on their website for a living: speed, reliability, support, and of course cost. In additional to reading this article, you may want to check out our test of the top hosted blogging/website solutions — The Ultimate Test of WordPress.com vs Duda vs Weebly vs Wix. Before we get started, here’s the table of contents in case you want to skip to a particular section of this (long) review. 1. Why do you need a good WordPress host? Before we get started, let’s take a look at why you need a good WordPress host? Why can’t you just use any old hosting company, or even set up WordPress on AWS and host it yourself? To be honest, we thought that too…until we hosted our main site on AWS for a couple of years. Now, we are pretty highly skilled in WordPress development, but as you will see later in our benchmark tests, our self hosted WordPress site was shockingly worse than the best of the hosting solutions in this roundup. It goes further than speed, however. Reliability is a huge factor if your business relies on your blog or website. It may not seem like much, but the difference between 99% uptime and 99.9% uptime can be thousands of dollars. Security is another very important concern for a managed WordPress host. WordPress is notorious for new security issues popping up frequently, and that means the host needs to be 100% on top of security management. If it’s not, and your site gets hacked, that could mean the end of your business. Then, there’s support. No matter how skilled you are, you are likely to need support at some point. When our developer first tried to use Bluehost, over a decade ago, the provisioning didn’t work properly, so there was no way to access his account. Even though he was a developer, he couldn’t solve his problem without help from support. Suffice it to say that if your business relies on your website, you want top quality support. For our ultimate test, we decided to look at the three most well known WordPress hosts: Bluehost, SiteGround, and HostGator. Here’s a quick background on each of them. Bluehost has been around since 2003. In fact, one of our developers actually tried to use it as his first host back then (although he ran into some problems — more on that later). The company currently hosts 2 million sites. What’s not well known is that Bluehost and HostGator are actually part of the same conglomerate, Endurance International Group, which owns a huge number of website hosting companies. Nevertheless, the two services have some striking differences. SiteGround has been around since 2004, but it’s smaller than Bluehost and HostGator. It’s more focused on WordPress hosting than the other two, and it’s deeply involved in the WordPress community. Unlike Endurance International Group, which is headquartered in the U.S., SiteGround is headquartered in Bulgaria. Like Bluehost and HostGator, SiteGround has datacenters all over the world. As explained earlier, HostGator is another company owned by Endurance International Group. It has been around since 2002, and has a large user base. HostGator offers WordPress hosting, as well as its own website builder (a la Wix), VPS, and dedicated hosting. However, they only started managed WordPress hosting in 2015. When we set out to do this, we decided that we wanted to create the most comprehensive, grueling WordPress hosting test of them all. That means real world tests of how a WordPress site performs, how secure it is, how good the support is, and total cost of use. We tested each of the platforms to determine how easy it was to provision and setup a WordPress blog. We also looked at the control panels/administrative dashboards for each host to determine which was easiest to use. Performance is key to a successful WordPress site. Not only do slow sites turn off users, but they hurt your Google rank. Even a millisecond difference in page speed can mean the difference between a #1 ranking page and a lower rank. If you’re going to run your business on a host, you need it to be reliable. We looked into the historical reliability of each of HostGator, Bluehost, and SiteGround, and we scored each one. Security is of utmost importance for a WordPress site, since there are so many attack vectors floating around online. We scored Bluehost, SiteGround, and Hostgator on their security. Support is vital to a WordPress host. No matter what, you’ll probably need to contact support at some point. 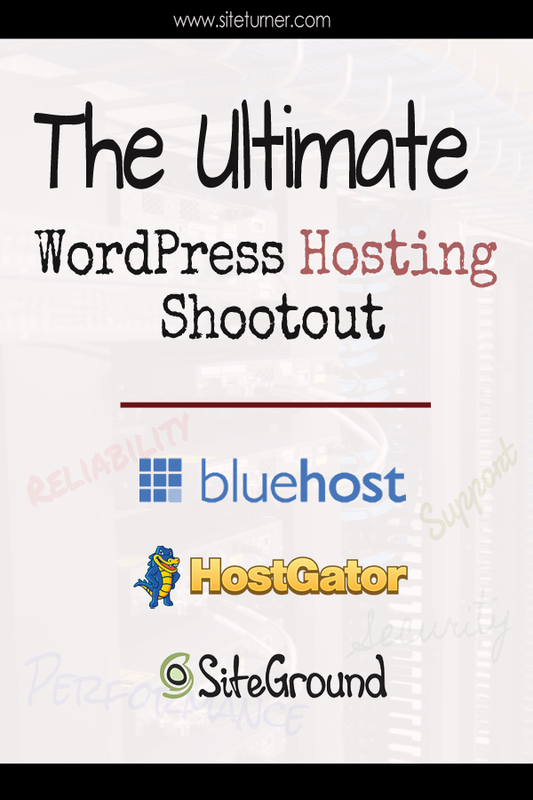 Does HostGator, SiteGround, or Bluehost have the best support? We have real world data. It’s easy to see the price for a hosting package…but what’s not so obvious is the total cost of using a particular host. Some hosts have provisioning fees, support charges, and other costs — and those costs add up quick. We take a look at what you’ll actually end up spending if you host with HostGator, Bluehost, or SiteGround. For the following tests, we compared each host’s advertised $5-$6/month plan. If there were multiple plans, we chose the one with the lowest non-promo cost. Note that the plans are all based on long term commitments, which we note later. We tested setup and administration for each host. In the following table, we assigned letter grades (A-F) based on how easy or difficult each was to use. * Not included in the plan we chose. After signing up for service on HostGator, you are sent to the dashboard. The dashboard is very simple, with a link to WordPress admin, cache settings, email, SSL, CodeGuard, SiteLock (we’ll discuss these later) and FTP. However, here’s where we found our first problem. HostGator sends an email telling you to log in to WordPress using the username “admin” and the password you entered at installation. But we weren’t asked to enter a password at installation. In fact, the only thing we were asked for was a PIN, which didn’t work as the password. We contacted tech support about the error, and were told it would be looked at; however, we never got a response and it never actually worked. We had similar problems setting up HTTPS on our site. HostGator is supposed to automatically create and install HTTPS certificates using Let’s Encrypt. However, it wasn’t working for us. Instead, we got a message saying, “Your Let’s Encrypt SSL certificate is unable to be validated at this time. For more information please go here.” Clicking the link revealed no helpful information. We returned to the issue 24 hours later, and the problem seemed to be resolved. SiteGround has a cool wizard to set up WordPress, making setup far easier than Bluehost or HostGator. The first thing that happens when you login is that you pick a theme and plugins — a lot like the experience you get on WordPress.com. It then configures everything for you. Everything from SiteGround pretty much worked out of the box, although we did have to turn on the performance optimizations for the SG Optimizer. For instance, you don’t have to do any WordPress or plugin updating when you start, as everything is installed at the latest release. The one criticism we have about the setup process is that the control panel is more complicated than HostGator and Bluehost. 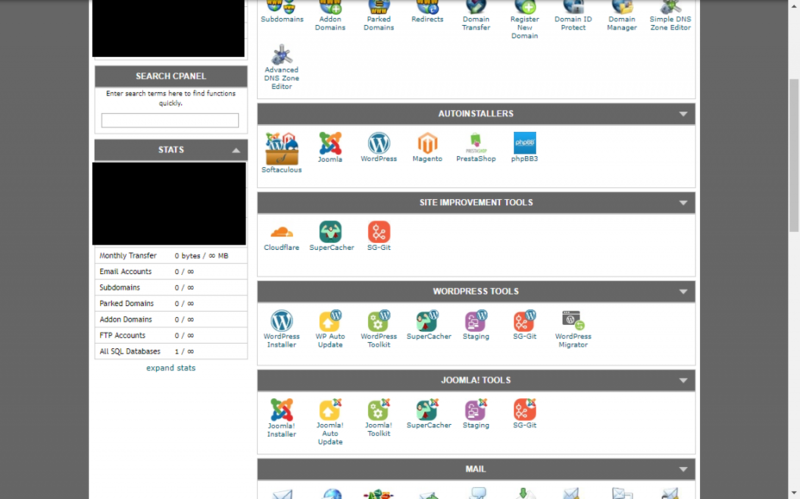 SiteGround uses and old-style cPanel, while the others have streamlined custom control panels. We had no bugs or problems setting up all of the performance enhancements either. Everything just stared working as soon as we turned it on — including CloudFlare integration, HTTPS, and memcache. 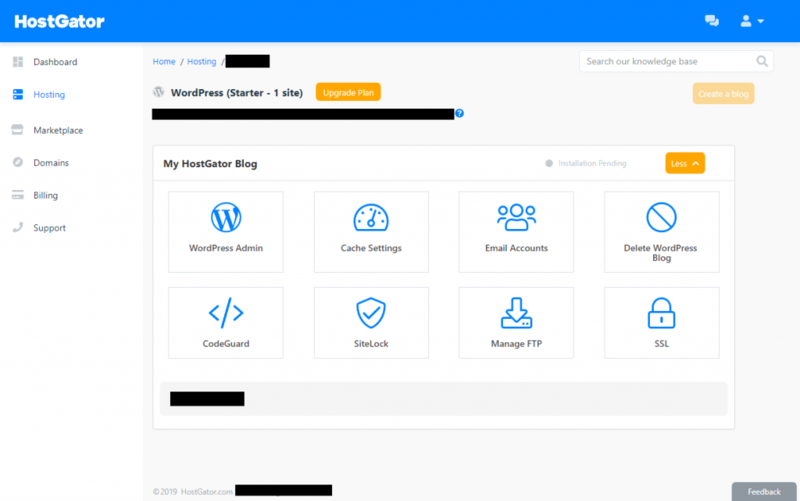 Like SiteGround, Bluehost has a wizard that helps you set up WordPress, instead of leaving you to do the setup via the WordPress dashboard. Bluehost also has a really nice management dashboard that you can use instead of the WordPress admin tool. It is cleaner and easier to use for beginners, allowing you to create users, manage security, and more. We immediately ran into a small problem (a 404 File Not Found page) when setting up our site. But after logging out and back in, we were able to continue through the setup pretty easily. Bluehost also has a nice wizard to help you get started within WordPress, although we got some errors while using it. After we got everything set up, and went to our site, we still saw the Bluehost “coming soon” page. It took us a while to figure out that you have to turn that off under settings. Everything else went smoothly with our Bluehost install. HTTPS was easy to turn on, and WordPress and theme updates work seamlessly. The latest version of WordPress is installed at time of provisioning. The first test we performed was page load speed. We used the open page testing tool WebPageTest.org to do the testing. For each hosting company, we determined the page load speed from several different locations around the world. In order to get the most accurate results, we tested at multiple times of day, and took the average. Below is a graph showing how HostGator, SiteGround, and Bluehost performed in page load tests. The lower numbers are better. In additional to individual page load speed testing, we performed load tests using LoadImpact on each of the hosts. A load test gives you a different perspective on how well a server can handle traffic. Whereas individual page speed tests give you the best case performance for your site, a load test tells how your site will perform under a heavy load. Ideally, when you have a lot of users on your site, you will see a linear ramp up in requests handled, and a relatively flat response time. If a server can’t handle the traffic, you are likely to see spikes in response time, and drops in request rate. In extreme cases, servers will start producing 500 errors, and failing to serve pages. We tested HostGator, Bluehost, and SiteGround using 50 simultaneous users, which would be an expected number for a moderate traffic blog site. HostGator performed the worst on our load test. In the chart below, you can see that early in the test, the response time stays flat, and the requests ramp up linearly. However, after a while, things go haywire. The requests rate drops to nearly zero, meaning the server is not responding to many requests. In the chart, you can see that the request rate stays linear, and follows the green user curve. You can also see that the light blue response time stays low and flat for most of the test, although at the end there is a huge spike. That spike meant the last few pages started to load slowly. Bluehost also had no noticeable increase in page load errors during testing, which is overall a good result. SiteGround definitely outperformed both of the other hosts on this test. In the chart below, you will notice that the request rate is very linear, and very closely matches the green user curve. That means that the server easily handling the additional users. 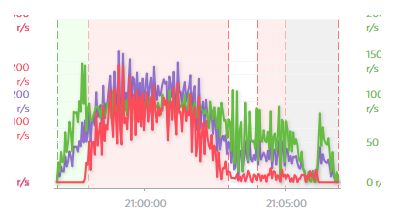 You may have noticed that in the SiteGround chart, the light blue response time curve looks like it jumps all over the place. However, if you compare the scale to that of Bluehost, you will see that response times for SiteGround hover around 50 milliseconds throughout the test. In contrast, Bluehost response times spiked to over 1 second. In all, SiteGround easily offered the best performance on our tests. Pingdom and HostingFacts have an uptime monitor that goes back for months for many different hosts. They track both uptime and response time. Below is a chart showing the average uptime from Pingdom over all of the months of tracking available. Below is a chart of the uptime for HostGator, SiteGround, and Bluehost over the past year, using the same data source. Note that the while the average above covers all data, the charts below only cover a year. The next chart details what Pingdom calls “response time,” which is essentially time-to-first-byte for a very basic page. You’ll notice that Bluehost does by far the best on this test. While the test is interesting, the tests in the previous section are much better for page load time in a real world scenario. For a basic understanding of the current level of security of our sites, we used HackerTarget and WPScan to perform vulnerability scans. Although neither of these tests is comprehensive, they can give us a good sense if there is a serious flaw with any of the hosting companies. That said, our sites on all three hosts passed the vulnerability tests, with few or no warnings. CodeGuard, Site Scanner, SiteLock!?! WTF? It seems every host has a half dozen different malware scanning and protection tools that they brag about. Some are included with your hosting package, and others are upsells. But are they worth it? Is SiteGround’s SG Site Scanner worth it? SiteGuard heavily promotes SG Site Scanner when you’re buying a hosting package. It’s pretty expensive, often costing more than your hosting plan — and you have to agree to at least 1 year of service. But is it worth the money? SG Site Scanner is based on Sucuri scanner, which is a well known security product. However, there are a lot of free alternatives to it, including the extremely popular and well-reviewed WordPress plugin WordFence. You can get a reasonable sense of what SG Site Scanner does by downloading the free Sucuri plugin for WordPress. Unless you have a large site, or a type of site that is more susceptible to hackers (gambling, program downloads, etc. ), the free version of WordFence should be sufficient, as long as you keep it updated. If you want a top of the line security solution, you should consider the paid version of WordFence, or Sucuri’s complete security solution. Are HostGator’s CodeGuard worth it? CodeGuard is simply a backup solution. It is included with WordPress packages, with a 1GB size limit. It’s definitely worth using, as backup is absolutely vital to a site. SiteGround includes backup without limits, and BlueHost includes backup on higher priced plans. 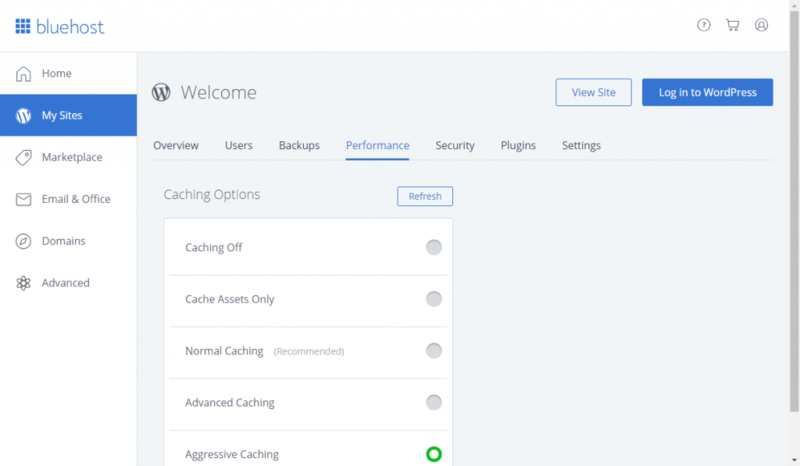 Is SiteLock worth it on HostGator or Bluehost? SiteLock is a useful service, which provides a daily malware scan, vulnerability scan, and more. It’s included with HostGator, but you have to pay extra for it on most Bluehost plans. It compares with SiteGround’s SG Site Scanner. You should definitely make use of it if you use HostGator, as it’s included for free. However, if you are a Bluehost client, we should suggest looking at WordFence first, as it’s free and very highly reviewed. In the past, HostGator has suffered some large and well-publicized security incidents. But times have changed, and their security has gotten much better. HostGator advertises a comprehensive security program for its WordPress sites. There is a combination of standard security measures provided by most hosts, like protection against distributed denial-of-service attacks, as well as WordPress specific security. The WordPress security functionality is provided by SiteLock, which is advertised as providing a firewall and automated vulnerability scans, along with WordPress malware detection. Additionally, SiteLock is supposed to offer automatic malware removal. Originally, SiteLock was offered to HostGator users whose sites had been infected by malware, and they charged excessive prices to remove the malware. However, HostGator is now offering some of the SiteLock services as part of their WordPress hosting package. According to HostGator, SiteLock will perform daily scans on your site. These include website scanning, FTP scanning, and database scanning. If it finds malware, the SiteLock SMART tool will clean the malware and restore your site. We were never able to get SiteLock working properly (and neither was HostGator tech support), so we couldn’t test it, but based on user reviews, it seems that the actual quality of the SMART tool is pretty good, and the protection level is relatively comprehensive (although by no means perfect). One additional note: there are also still concerns with CSRF and other vulnerabilities in HostGator’s account management, even as of 2019. Although we wouldn’t drop a host based on this, it’s worth being aware of. Our site on HostGator passed our basic vulnerability scan. SiteGround hasn’t had any well publicized security breaches, although that may be because until recently, it has been much less well known than its competitors. SiteGround advertises the following protections: an intrusion protection and detection system, ModSecurity firewalls on all servers, separated web server environments using Apache with suExec, and fully updated PHP 7. For WordPress specifically, SiteGround (like the others) does automatic updates, and has specialized firewall rules to protect against known and unknown issues. In addition, Siteground WordPress hosting is integrated with CloudFlare. So you get the added DDoS and intrusion protections that they offer. They also protect from SQL injection, spam, XS attacks, and more. However, SiteGround is definitely not perfect. According to pluginvulnerabilities.com, SiteGround’s SG Optimizer has opened up a vulnerability in the past, although it appears to be fixed now. Our site on Siteground passed our basic vulnerability scan. Being a sibling to HostGator, Bluehost uses much of the same security technologies and methods. They use SiteLock for much of their security. There are definitely mixed reviews about Bluehost’s security online. In our experience, most of the security issues people face when using Bluehost are due to the user’s plugins or other settings. Nevertheless, Bluehost has had some well publicized security breaches. In 2015, Bluehost was hacked by the Syrian Electronic Army. More recently, there have been vulnerabilities discovered in many of Bluehost’s offerings, according to Threatpost. Like the other hosts, our site on Bluehost passed our basic vulnerability scan. In order to compare support for HostGator, Bluehost and SiteGround, we contacted the support via phone or chat with a problem. Although the problems were different, they were of similar complexity. Below, you can see how long it took for us to speak with someone, and how long it took to get our problem resolved. We had multiple problems in setting up our WordPress site on HostGator, so we had plenty of opportunities to test out HostGator’s live chat tech support. In our test, the live chat did not have a wait time; however it was a total of around 13 minutes before we actually got to discuss our question with the tech support person (the rest was spent waiting, and authorizing our account). The live chat person was unable to help, and escalated the problem to the “billing administrator” — although we aren’t sure why. After 20 minutes, we got a response from the live chat attendant saying that the problem is “being processed,” and we would receive an email when it was fixed. We received an email about 24 hours later saying that HostGator is aware of the problem, but they didn’t know how long it would take to fix. As of the writing of this article, it still hasn’t been fixed. In order to test SiteGround’s support, we messed with a few settings in the cPanel, and caused a redirect loop on our site. The result: when a user goes to the site, they get a browser error message saying there are too many redirects, and you should clear the cache. We contacted support, and in less than 1 minute we were able to get to a live agent and communicate the problem. The agent appeared to immediately know what to do, and after a 6 minute wait, he told us that he had gone into the cPanel settings and resolved the issue. Indeed, the problem was fixed and we were able to get back into the site without issue. SiteGround support is one of the reasons why so many people recommend it. We found that their support lives up to its reputation. We contacted Bluehost with a somewhat easier issue than we had with SiteGround and HostGator, but they performed well nonetheless. It took us about 3 minutes to speak with someone, and a total of around 5 minutes to get to discussing the problem with the Bluehost representative. The representative was courteous and helpful. We had to be put on hold for a bit, but our issue was resolved within a total of 15 minutes. While this wasn’t quite as good as SiteGround, it was much better than HostGator, who never actually resolved our issue (it’s important to note, again, that the HostGator issue was more complicated — although that’s because the HostGator product wasn’t working properly). In the end, there was a clear winner in this comparison, and that was SiteGround. Not only did they fix our complex technical issue properly, they also had the shortest time to getting a resolution. One of the most important things to consider when choosing a host is the cost. But cost is more than just the advertised monthly price. You need to consider contract terms, cancellation, and setup fees. In this section we look at these costs. Below is a comparison of what’s included with plans from HostGator, SiteGround, and Bluehost. Although HostGator, SiteGround, and Bluehost have plans that are advertised at the same price, the actual cost to you varies greatly due to the contract terms. For instance, if you want to pay month-to-month for SiteGround, you’ll end up paying almost $30/mo for the $5.95 plan. Below, we compare the terms of each host. All three of the hosting companies allow you to stop renewals via their website. For HostGator, you can cancel renewals here. For SiteGround, you can cancel renewals here. And for Bluehost, you can cancel here. However, if you want to cancel before the end of your term, and you want to get your money back under each of the companies’ money back guarantees, you will have to contact them. We have found it easiest and quickest to cancel via chat. The companies generally tell you to call, but they will all let you cancel via chat online. After looking at all of the results of this test in depth, we had one clear winner, and a runner up. The best host in almost every category was SiteGround. It had the best performance, the best average uptime, and by far the best support. We would definitely pick SiteGround over either of the competitors under most conditions. In second place was Bluehost, which was slightly easier to set up than SiteGround, but otherwise trailed SiteGround in the other categories. Finally, HostGator trails the other two significantly, but it may be your only option if you’re looking to do month-to-month hosting.